The grey mouth-like slot near the bottom allows you to insert one end of the ticket (length wise). 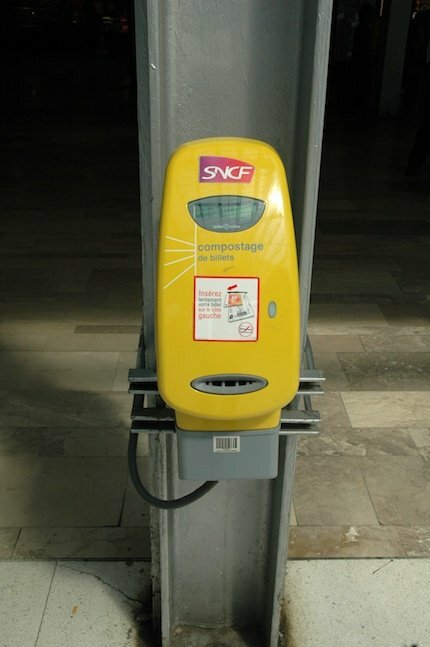 Use the left end of the ticket, where there is usually a bar code and an SNCF logo. Also, insert the ticket face up (magnetic stripe down). After you hear a printing noise similar to an old dot-matrix printer remove the ticket. Here is a photo of a validated/composted TGV ticket. Just left of the barcode is a line reading “P Lyon 2106080926”. That is the compostage or validation stamp created by the yellow machine above. After this is done, the ticket is valid for travel. TGV tickets are similar to airplane/flight boarding cards in size and shape. 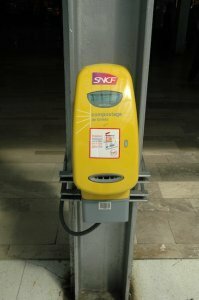 These tickets or “billets” shouldn’t be confused with the smaller regional Billet Ile-de-France tickets used for Transilien trains which use different validation/composting machines.